YPS schottky thermal field emission sources, TFE emitters for EM, SEM, FEM, FESEM SFEG, FEG FETEM, EPMA, CD-SEM and Auger. The YPS Schottky type thermal field emission sources are an excellent choice to replace used TFE sources in electron beam systems, including FESEM, SFEG-SEM, FETEM, EPMA, Auger and CD-SEM systems. The YPS sources are drop-in replacements for existing FEI and Denka style sources also known as 184 and 174 type suppressors. The YPS Schottky TFE source consists of a single crystal (100) tungsten wire with a very sharp tip including a zirconium reservoir around the tungsten tip wire. The tip is mounted on a hairpin filament which is used to maintain the tip ate a temperature of around 1800K. This assembly is mounted in a cylindrical suppressor electrode with an aperture through which the sharp tip protrudes. Electrons are emitted from the tip due to both thermal excitation and the electrical field at the tip. The YPS Schottky TFE source tip typically has a radius of 0.3µm and protrudes around 250µm to ensure high brightness of the source. Schottky thermal field emitter module. FEI Schottky TFE emitter module. for the FEI TFE module. The YPS FEI FEG and SFEG Schottky TFE module is a complete exchange module assembly replacement for the FEI TFE module used in the FEI XL-30, Sirion, Inspect and Nova NanoSEM systems. The FEG or SFEG emitter module is supplied within the gun assembly and is factory pre-aligned. It is available for the FEI systems units, the FEG TFE module assembly and for the SFEG Sirion module assembly. This is available as a complete gun module exchange only. The complete TFE gun assembly will be shipped under inert nitrogen gas with a protective container mounted on the gun assembly flange. The type of TFE source can be identified through the silver label on the gun assembly flange. ** The 184 type TFE emitter module can also be found on other electron beam systems. Contact us for replacement. *** YPS-174 Schottky TFE emitter modules for Hitachi FESEMS, Hitachi CD-SEMs and JEOL FESEMs are only compatible with Hitachi and JEOL FESEMs which use a thermal field emitter. 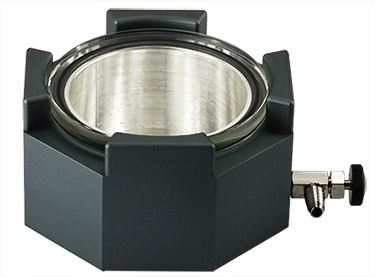 Cold field emitters are not compatible with the YPS-174 or YPS-184 modules. **** Tescan uses both 174 and/or 184 type TFE emitter modules . *Nettopreise zuzüglich gesetzlicher Umsatzsteuer. Wir verkaufen nicht an Privatpersonen. . 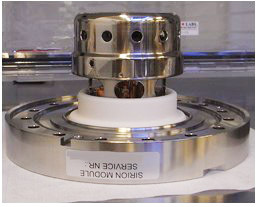 The electron source performance table is provided to give additional information into the performance and requirements for different type of electron emitters. Tungsten cathodes are still used in many SEMs. Improved results can be obtained with LaB6 cathodes. The highest resolution, highest brightness and best low kV performance can be achieved with either Schottky or cold Field Emission Sources. Q. Are TFE sources less reliable than thermionic sources (e.g. Tungsten or LaB6)? Q. What are the advantages of Schottky thermal field emission compared to cold field emitters e.g. W(310) or W(111)? A. The major advantages are better beam current stability, higher beam currents, less stringent vacuum requirements and the fact that there is no need for periodic emitter flashing to restore the emission curent. Q. What are the vacuum requirements for operation of a Schottky thermal field emission source? A. Normally, 10-9mbar or better at the source region. Q. What brightness can be achieved with Schottky TFE sources compared to thermionic sources? A. Schottky TFE emitters have a brightness of about 10xE8 Acm-2sr-1 against 10xE5 Acm-2sr-1 for thermionic sources. A. Not really. The lifetime of a Schottky emitter is determined by the life of the Zr reservoir in the tip structure. This is normally about 8000 hours. A. Check the vacuum level be 10-9mbar at the emitter. Care is needed to avoid thermal shock to the emitter and to avoid electrical breakdown transients as the extraction voltage is applied. Further, the operating temperature should not exceed 1850K; see data sheet for current/temperature graph. Q. How do I operate the YPS Schottky TFE emitter? A. In the same way as other TFE sources. 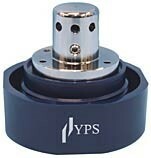 The YPS source is supplied with a Schottky emitter data sheet, unique to each emitter. Q. How stable is the beam current of a Schottky field emitter compared to a cold field emitter? A. Beam current stability for the thermal Schottky is <0.5%/h compared to 5-30% drift and random jumps for a cold field emitter. Q. Can any thermionic source be replaced by a Schottky TFE source? A. Yes, this is the YPS C>More column upgrade. There will be the need for additional differential pumping at the emitter region and a dedicated HT power supply unit for the TFE source. Contact us for details. Q. Can a cold field emitter be replaced by a YPS Schottky TFE source? A. Not as a drop-in replacement. Only when the complete electron gun and HT power supply are replaced. Contact us for details.